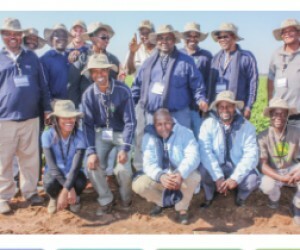 The extent of the Transformation Programme within Potatoes South Africa (PSA) is vast and aims to ensure the development of new Black commercial potato farmers. Farmers are supported for a period of four years, where PSA will supply them with seed potatoes on a sliding scale basis (Y1=100%, Y2=75%, Y3=50%, Y4=25%). The initial engagement with the farmers was that PSA will provide seed for between 3 and 5 ha, training where necessary, technical support and also expose the farmer to the industry through the New Farmer Induction initiative. Based on the support model described above, there were a number of challenges that farmers experienced, the major one being access to finance and machinery. PSA subsequently adopted a new implementation process which focusses on identifying Black producers who are already farmers (with other commodities) and introduce potatoes to them. Thereafter a pre-feasibility study is conducted as part of a selection process. A business plan is then compiled, partners such as financiers, input suppliers and off takers are identified and the farmer is linked with other partners in the potato industry. Approval was also granted by all the structures to focus on expanding the hectares of deserving farmers who are already participating in the Enterprise Development Programme to more than 5 ha, i.e. to expand them to become fully fletched commercial potato producers. The result is that progress is increasingly more visible, as the number of hectares of potatoes planted by Black farmers is on the rise, and there are farmers who have already been identified as having the potential to farm commercially. Currently there are 33 active farmers involved in various provinces. The Transformation Programme also aims to address food security by engaging with rural communities and assisting them with planting potatoes economically for own consumption. 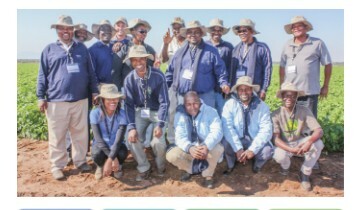 The main aim of the Small Grower Development Programme is to disseminate production and business information through trials, provide farmers with practical training on good potato production practices, and to utilise cultivar or demonstration trials as a way of educating, training and disseminating important production information that is necessary for successful potato production. A successful example is when PSA paid a visit in 2015 to some small holder farmers near Stutterheim in the Eastern Cape, one of the resource poorest regions in South Africa. What was found was a group of extremely dedicated smallholder farmers who had land available and were prepared to work hard to produce food for their community. However, they lacked the necessary skills as well as inputs and were consequently struggling to successfully produce potatoes. The project kicked-off in October 2015 using special basic implements and the correct chemicals. The very motivated young smallholder farmers were divided into teams to plant the potatoes themselves. In record time 0.4 hectares of potatoes were planted and correctly sprayed for broad leaf and grass type weeds, as well as for pests. To ensure the success of the project fungicides, a spray program for later use was also supplied and which were strictly followed and applied by them. As part of the training, the advantages of a proper crop rotation system was also explained, in order to ensure continuous good yields. The potato crop was harvested during January 2016. Not only was the quality of the potatoes quite good, the dry land yield of eleven kilograms per five meters was also something that brought a smile to the faces of the farmers. 20% of the potato crop was supplied to the local community. The remainder was sold at R50 per 10 kg bag on the farm ensuring a handsome profit after deducting expenses. In view of the success of the projects, it has been decided to expand the project to develop these farmers even further. The Small Grower Development Programme receives a lot of support from the Department of Agriculture, Forestry and Fisheries (DAFF), particularly KwaZulu-Natal, Eastern Cape and the Western Cape. In 2015/2016 alone, 20 projects were supported with over 700 beneficiaries attending information days. Furthermore, under the Tertiary Skills Development Pipeline, the Potato Industry Development Trust (PIDT) annually awards bursaries to deserving students studying towards an agricultural related qualification with the emphasis on potato production. The Undergraduate Bursary Programme is primarily aimed at developing the skills of young talented students at existing potato enterprises. Their development is done through tertiary education at universities and agricultural colleges. The Post Graduate Bursary Programme, on the other hand, is aimed at making a contribution towards ensuring sufficient post graduates to address the relevant research areas affecting the industry, as well as increasing the industry’s pool of appropriately qualified scientists. The Research and Development Department of PSA, together with the Transformation Department are jointly responsible for funding and identification of post graduate students. Since the inception of the Tertiary Skills Development Pipeline in 2008, 67 undergraduate and 36 postgraduate students have been assisted through the scheme. Student Induction usually takes place early in the academic year with the aim to introduce new students in the Tertiary Skills Development Pipeline to the broader aspects and role-players in the potato industry. The induction takes place over a two-day period during which informal tours to one of the major fresh produce markets, a packhouse, potato harvesting in the field, the potato gene bank at the ARC and Plantovita laboratories at Roodeplaat. PSA also provides a comprehensive overview of the entire potato industry at Potato House, including the role of the information system within the Potato Industry, Research and Development, Generic Product Promotion and Market Development, Potato Certification Service, the Bursary Committee and Transformation. The students always consider the induction programme to be of high value. In their evaluation reports the following feedback is often received: the programme sheds light on aspects in the potato industry of which they were previously unaware of, such as how costs provided better insight into production and how markets function; that the practice of rotating potatoes with other crops as a means of disease prevention is quite interesting; the visit to the ARC brings theoretical knowledge into context and that after the farm visit they have a better understanding of the process of potato production, from lifting, grading and packaging as well as the amount of effort that it takes, amongst others. The Internship Programme is primarily aimed at providing experiential training opportunities to PIDT bursary recipients whose study disciplines require practical training and exposure as part of their qualification. The workplace programme is aimed at affording the students with the opportunity to obtain workplace experience to enhance their employment opportunities. Since the inception of the Internship Programme in 2012, 37 students received workplace experience. Apart from Farm Based Training for the farmers themselves to address skills shortages, training is also provided to their employees. For more information on the Transformation Programme visit http://www.potatoes.co.za/transformation.aspx. As an organisation PSA is also embracing Transformation. During the 2015 PSA Congress, Mr Ernst Yzel was unanimously elected as chairman of PSA for the next two years. He worked tirelessly to put the new constitution of PSA in place which was approved by Congress. This included provision for more representation by black producers on PSA's Board of Directors/National Council, namely Mr Joseph Bantam (Western Cape), Mr Siseko Vikilahle (Eastern Cape), Mr Shadrack Mabuza (KwaZulu-Natal) and Gift Mafuleka (Gauteng). This bold move is a clear sign of the potato producers' commitment to the future of this country.